CarGurus has 135 nationwide RS 7 listings starting at $49,900. This power-packed 4-seat Audi, based on the more sedate A7 and borrowing some athleticism from its S7 stablemate, looks mighty fine even as it shouts “elite” from the newly upgraded grille to the debuting re-designed taillights. And remember the old fastback look of yesteryear? Well, there’s your A7, your S7 and, of course, your RS 7 profile in a nutshell. The 2015 edition of the muscle-flexing RS 7 again comes in only one trim, the perk-packing 4.0T Prestige Quattro, with that “Quattro” designation assuring one and all that the traditional standard full-time all-wheel drivetrain (AWD), for which Audi is justly famous, remains standard equipment. Although this formula-busting 4-door was introduced for the 2014 model year, changes for 2015 include a number of subtle (very subtle) improvements to its appearance with the aforementioned grille and taillight tweaks. Additionally, an understated reworking of the dashboard, steering-wheel controls and instrument cluster, as well as upgraded Audi connect smartphone apps, now with LTE connectivity, complements a couple of improvements to the optional night-vision technology. Power stands pat for the RS 7’s sophomore year with the return of a potent 4.0-liter twin-turbocharged V8 engine. Under the management of the supremely capable 8-speed shiftable automatic transmission (with standard steering-wheel-mounted paddle shifters), this force-fed V8 pounds out 560 hp and 516 lb-ft of torque, while mileage remains 16 mpg city/27 highway burning premium-grade gasoline. Standard appearance accouterments in the 2015 RS 7 remain 20-inch alloy wheels boasting performance tires, an adaptive air suspension, sport differential, heated power-adjustable mirrors, power sunroof and power-opening hatchback lid, and upgraded-for-2015 full LED exterior lighting. Inside, this fabulous 4-door packs 24.5 cubic feet of cargo area to the rear seatbacks. And once again, the RS 7 boasts split-folding rear bucket seats that improve on this toting tally, but Audi isn’t saying by how much. In any case further interior bling includes premium leather upholstery, leather and carbon cabin appointments, heated power-adjustable front sport seats and full power accessories. Of course, cruise control and telescoping tilt-wheel steering return to the RS 7 for the upcoming year, as do the standard rear-view camera, front and rear parking sensors, and remote garage door opener. An auto-dimming rear-view mirror also returns for 2015, along with 4-zone auto climate control and memory for driver’s settings. Techno-goodies, you wonder? Start with a 630-watt, 14-speaker Bose premium stereo that boasts a single-CD player, satellite and HD radio and a memory-card slot, with all of it managed by Audi’s MMI (Multi Media Interface) infotainment display. Add to that standard GPS navigation and the new-for-2015 Bluetooth-integrated LTE web-based interface on the Audi connect feature and you’ve got one rockin’ car. But wait, there’s more. A safety-slanted Driver Assistance Package, with adaptive cruise control, lane-departure warning and lane-keeping assist, not to mention corner-view cameras and front collision mitigation is again optional for the 2015 RS 7, as is a Cold Weather Package that stars heated rear seats and a heated steering wheel. Also optional is the Comfort Seating Package with multi-adjustable contoured front seats boasting a massage function as well as comfort-contoured rear seats. Several Optics packages for various upgrades to appearance features, including color-coordinated outside mirrors also remain available. Standalone options returning to the 2015 RS 7, meantime, include 21-inch up-styled wheels, a sport exhaust, power-closing doors, faux-suede headliner and a 15-speaker Bang & Olufsen Surround Sound audio system. Finally, standard safety stuff aboard this audacious Audi includes 4-wheel antilock brakes (ABS), traction and stability control, front and rear head airbags, front side-mounted airbags and front knee airbags. Those already-mentioned reworked LED headlights, meantime, are complemented by LED daytime running lights, a post-collision safety system and a remote antitheft alarm, while rear side-mounted airbags, the improved night vision system and a head-up windshield display remain optional. 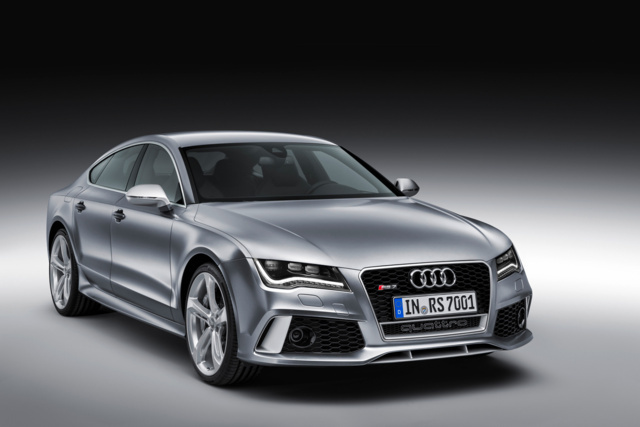 What's your take on the 2015 Audi RS 7? 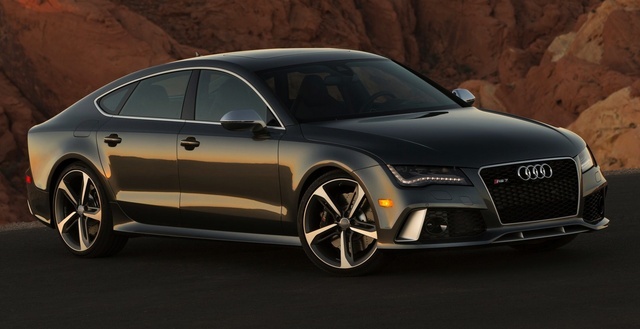 Have you driven a 2015 Audi RS 7?